Theodore J. Wint was born in Pennsylvania, March 6, 1845. He was educated at Providence High School. He married Lydia Porter Bullis, 1880. He served as Private, General Mounted Service, 1865. 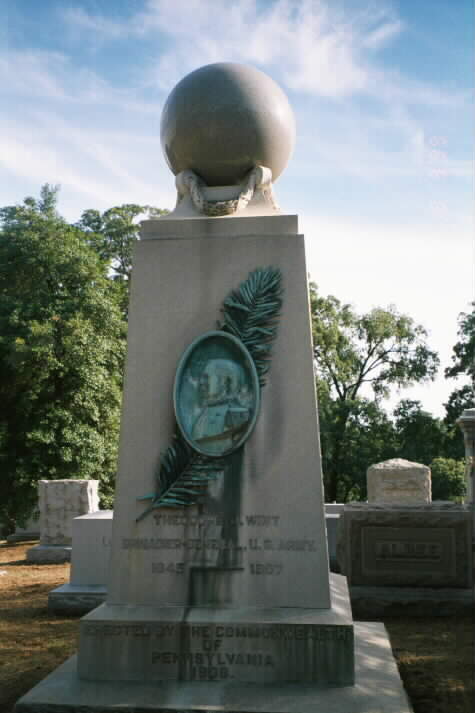 He was appointed to the regular Army, Second Lieutenant, 4th United States Cavalry, November 24, 1865; promoted to First Lieutenant, May 9, 1866; to Captain, April 21, 1872; to Major, 10th United States Cavalry, May 6, 1892; to Lieutenant Colonel, 6th United States Cavalry, April 8, 1899; to Colonel, February 23, 1901; and to Brigadier General, United States Army, June 9, 1902. 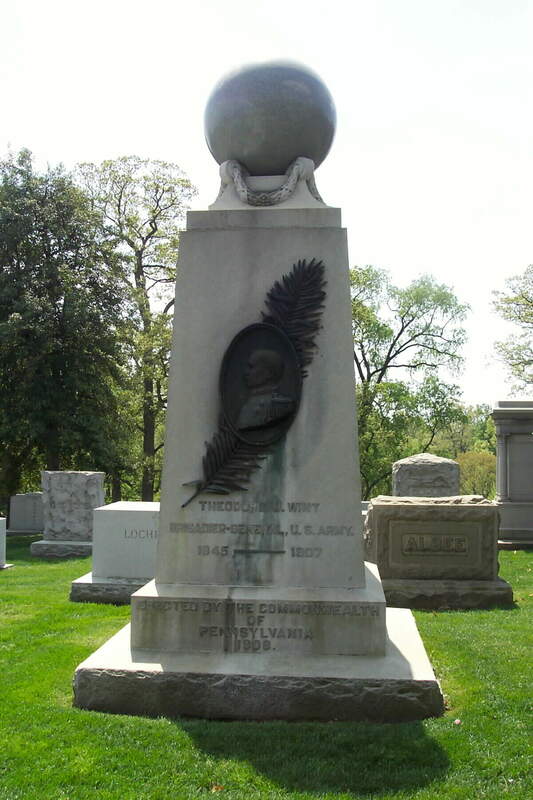 He died in 1907 and was buried with full military honors in Section 2 of Arlington National Cemetery. The fortifications (in the Philippines) were assigned the name Fort Wint in honor of Brigadier General Theodore J. Wint who had served in the U.S. Army during the Civil War, Indian campaigns, the War with Spain and the Philippine Insurrection. 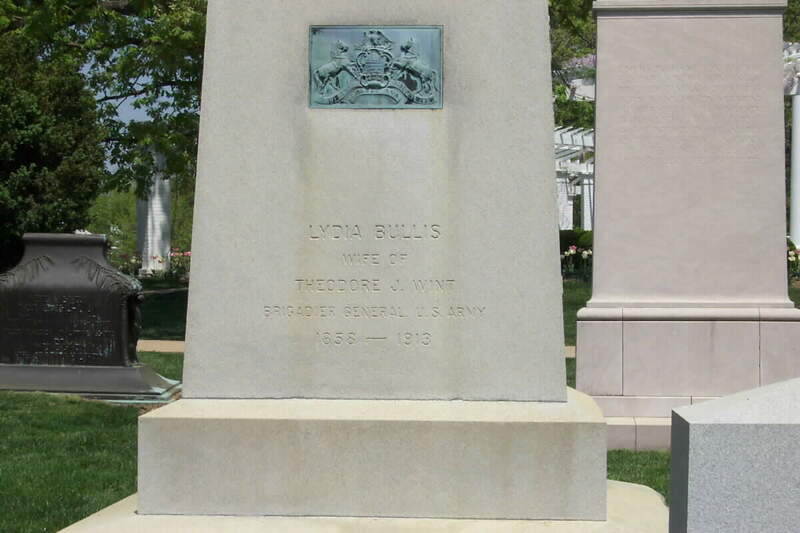 Further up the hill (at Arlington National Cemetery), I noted a monument to little-known Brigadier General Theodore J. Wint (1845-1907), a veteran of the Civil War, Indian Frontier (1866 to 1888), Cuba (1898), China (1900-1901), the Philippines (1901-1904) and the Army of Cuban Pacification (1906-1907). Here was a man, I thought, whose career encompassed a good deal of American martial history, a 20th-century link to the past -- and a Spanish-American War veteran to boot. Major Theodore J. Wint of the Tenth Cavalry,one of the officers wounded (battle of Santiago, Cuba), was born in Pennsylvania, and first saw service as a Private in the Sixth Pennsylvania Volunteer Cavalry in 1861. He was honorably mustered out of that service as a First Lieutenant in November 1864. He enlisted in the Regular Army as a Private in February 1865, and gained a commission as Second Lieutenant in the Fourth Cavalry on November 24 of that year. In May 1866 he was advanced to the rank of First Lieutenant. His commission as Captain was dated April 21, 1872, and on May 6, 1892 he was promoted to be Major ofthe Tenth Cavalry. WASHINGTON, March 25, 1907 - With full military honors, the body of Brigadier General Theodore J. Wint, U.S.A., former commander of the Cuban Army of Pacification, who died in Philadelphia on Thursday last, was buried in Arlington today. The funeral train arrived in this city from Philadelphia at 3:30 o'clock and was met at the Pennsylvania Station by the honorary pallbearers and a military detachment, consisting of four Troops of the Thirteenth Cavalry and the Fourth Battery of Field Artillery from Fort Myer, commanded by Major D. J. Rumbough, Artillery Corps. At the gravecommitment services were conducted by Chaplain H. A. Brown, Artillery Corps.